Albero ’10 Tempranillo Barrica. Organic, vegan. From Spain’s oldest winery. Albero ’10 Tempranillo Barrica. Organic, vegan. Soft, complex, balanced acidity. Spice, cocoa, red fruit, vanilla, very dry. From D.O. Utiel-Requena (Valencia) Spain. Aged 4 months in American oak. Bodegas Irzano is Spain’s oldest winery, founded in 1335. 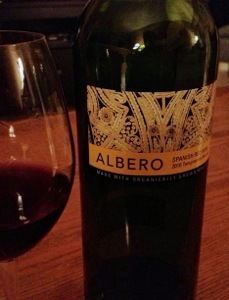 A nice wine, and very affordable. Purchased at Trader Joe’s, Chicago. Next Next post: Trying to decide which Chris Bacon signed, numbered Giclee print to frame and hang. All 3 look amazing!